Elsewhere in the whole universe Elections are decided by the ballot, which is the most acceptable means of making choices for those in Political Offices, in which case the person with the highest number of votes is declared winner reflecting the people's will. Unfortunately, this is not the case with Nigeria. Here, it is a completely different Ball game. In Nigeria it Selection by the barrel of the Gun. The Masses are robbed of their mandates by intimidation through, kidnapping, killings and unfair judgement by the Judiciary. The opposition Parties to a sitting Government are strangled to a point that they gasp for air. The Government uses all security operatives in the country to cause chaos. Security details takes over the conduct of the Elections from the Electoral umpire INEC. The Army and Police were captured in the recently concluded Elections, hijacking Electoral materials from polling Units, they were captured shooting at unarmed innocent citizens whose only crime is Participating in the Election. They were captured stopping Electoral process. We remember vividly how the past Police Chief aided in Kano State Election Fraud in 2015, which claimed the lives of the State INEC Chief and his entire family. He was rewarded by the government and given the highest position in Police, Inspector General, a position he held for 4 years without questioning of his role in the death of that Family. While the Security Operatives are carrying out this Evil, the Election umpire (INEC) is not left out, nor the International Observers. The Electoral umpire INEC, is also found colluding with the Security Operatives to deny the people their mandates. INEC, is not interested in how results are submitted to them. They are not interested in how many people got killed by Security operatives while trying to manipulate results, they don't care to hear from their Staff/Agents who came face to face with such robberies. They are quick to announce anything sent across as results through anybody. The Foreign Observers can't be separated from this show of shame. They are found shielding the crime in their Reports to the world. The recent Election has destroyed the little trust we had for this group. They are also accomplices to this crime against humanity. Nigeria being a very corrupt Nation may have bought them over to hide the truth. Foreign Observers witnessed the bloodbath in virtually every State and the role played by the Security but it went out to describe the Election as being #Fair. They can't be trusted anymore if they can hide all the crimes just to subvert Justice. It is glaring to everyone that Nigeria cannot and will not continue to exist under this state of Lawlessness. 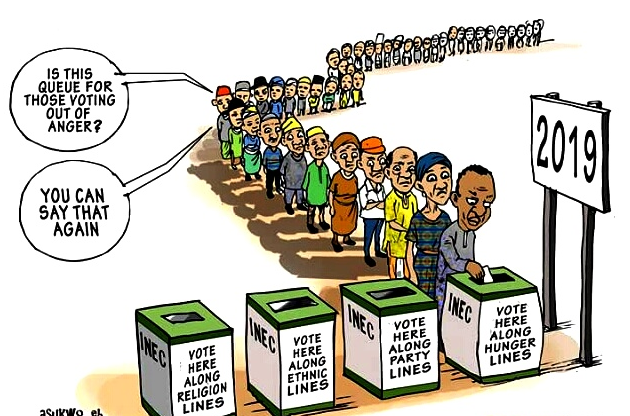 If conducting an election cannot guarantee the security of life and property of the citizens, if conducting Elections cannot guarantee the choice of Leaders as desired by its citizens, if conducting Elections means a Highway to the grave, then, it is time to shut down the system because NIGERIA has become IRREDEEMABLE. We the Indigenous People of Biafra have long expressed our desire to be separated from this madness. We are a completely different people from the rest of Nigerians. We are civilized and very Innovative. We strongly believe that if granted an independent Nation, we shall explore our ingenuity in all spheres of Life in a very short time and build a new Nation to the envy of the world.